In math circle on October 4, we had two graduate students, Jamie Haddock and Kevin Lamb, speaking about networks and fractals including Sierpinski’s triangle. Jamie spoke about networks, describing their basic structure and some measurements that describe how well connected a network is (degree and betweenness). The students discussed what makes a node (person) ‘important’ in a social network and discovered that those people that bridge communities are most important in the dissemination of information (or gossip, as we talked about). We then looked at social networks with the focus of the spread of disease, and played with a cool website: http://vax.herokuapp.com. Finally, we discussed transportation (road) networks and Braess’s paradox which is the surprising result that adding a road to a network WON’T always increase traffic flow and can often slow down traffic. Patterns show up everywhere around us. Nature wants to use as little energy as possible to create things, so it is natural to think that it will use the easiest shapes over and over. For example, a tree is one really thick stick (the trunk) with a whole bunch of smaller logs (the branches) attached to it, and attached to the smaller logs are even smaller logs (the twigs). This idea of repeating a shape over and over on smaller and smaller scales is the basis for fractals – fractional dimensional objects. In Math Circle this weekend, we talked about how we can talk about fractals mathematically as sequences of recurring patterns on smaller and smaller scales. The Sierpinski Triangle served as our key example for this discussion. We showed that this object has a perimeter of infinite length but that it contains no area! Such apparent contradictions occur frequently in nature, but we have a developed mathematical understanding of them. 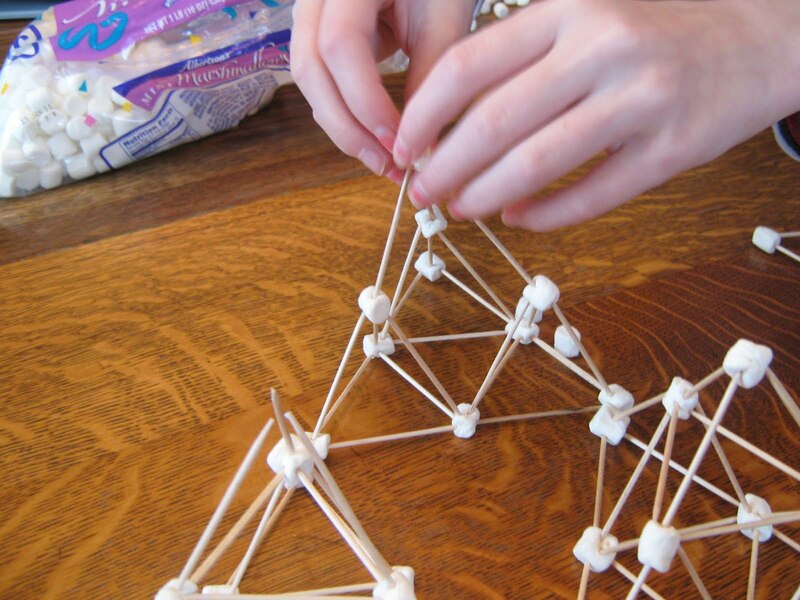 After demonstrating these strange phenomena using geometric series, we moved on to an activity where the students were able to construct their own Sierpinski tetrahedra (the three-dimensional version of the triangles) using marshmallows and toothpicks – see the picture for an example. Realizing the self-similarity of these objects, the students then combined them into yet another larger fractal-like object which continued to the next iteration. Immediately following their construction, the creations were promptly eaten with lunch.